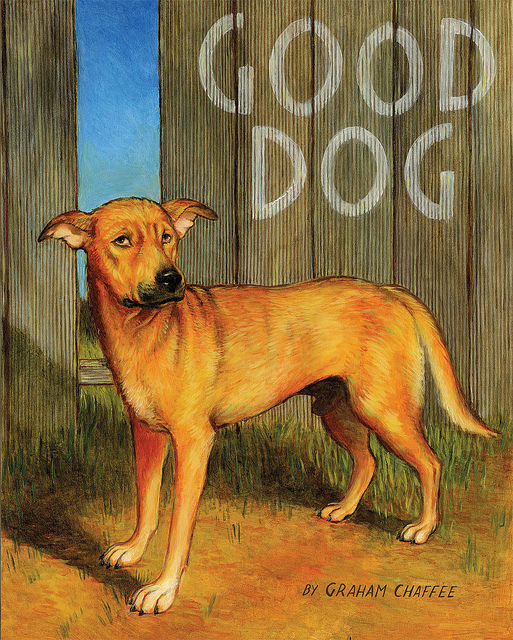 I'd been hearing a bit on the whisper-sphere about Graham Chafee's Good Dog, so in a moment of academic task avoidance I hit Fantagraphic's site to see what the skinny was (forgive me my trespasses okay? I've always wanted to say that). I have a weird habit where I only like to read a few lines of blurb or summary and that's enough to gauge interest; I like to leave as much of the discovery to the actual reading of a book as I can. Anyway, the skinny: I pre-ordered it. I have a feeling it's a book that will make you cry. If you want a longer skinny, there's the full preview complete with pages below. 'Ivan, who is plagued by terrible nightmares about chickens and rabbits, is a good dog — if only someone would notice. Readers accompany the stray as he navigates dog society, weathers pack politics, and surveys canine-human interactions.